“With the development of LED technology, the LED light source of plant growth-promoting the rise of the factory model. According to incomplete statistics, China has built a plant of more than 80 plants, according to experts predict that Japan Co., Ltd., China is expected to reach Japan’s future plant factory plant more than 10 times the size. “Director of the joint innovation center in Guangdong Province semiconductor lighting industry, said the rise of the factory plant, will drive changes in agricultural and LED industries, might be able to find a new way for the traditional LED industry. It is understood that the concept of factory plant was first filed in Japan, it is to build a modern high-tech agricultural production systems. In this production system, through LED lighting technology, intelligent control technology and soilless cultivation techniques combined with each other to achieve environmental factors and fertilizer management and control integration and intelligent, the plant production is not affected by environmental factors, geography, climate, etc., and can avoid land, water and pesticide use excessive heavy metal contamination occurred, compared to the traditional open environment for agricultural production and food safety control is more reliable source from the production. The base is located in Guangdong Province demonstration of new light industrial base within the transformation from an area of ? ?150 square meters of office, is an intelligent system has a complete miniature plant factory. 4-layer three-dimensional cultivation base, the actual acreage of 126 square meters, in the usual leafy crops, planting process using LED grow lamp light, the implementation of integrated management and control of water and fertilizer. 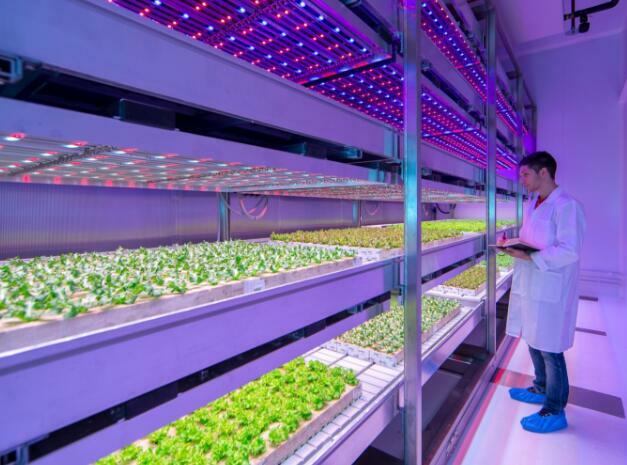 In addition, to achieve high-precision environmental control, computer temperature crop growth process, humidity, light, nutrition and other environmental elements of automatic control, making up to foster leafy 20000. I also learned that, in the present application and demonstration base output of vegetables, the price will cost over one. Compared to the market selling organic vegetables, a lot more expensive. Plant Factory is currently in the research stage, the application costs still need some time to settle down and start from the common variety grown vegetables, the future will apply to the high economic value of the plant. He admitted that, with the further decrease in LED technology-based plant artificial radiation sources (PARS) the application of cost can be expected plant factory will usher in golden period of development.